The Tallahassee foreclosure rate has fallen again compared to last year, according to September figures released Monday by Metro Market Trends. This is the tenth consecutive month of year over year declines that began in December 2010, and it is a promising sign for the long-troubled Tallahassee real estate market. There are still a lot of distressed properties for sale in Tallahassee, and new lis pendens filings (the beginning of a the foreclosure process) continue to come in at rates that are multiples of what Tallahassee has experienced in the "normal times." But the rate of new filings is dropping as well. This might mean that the worst is behind us as far as homes being foreclosed, but the current rates will continue to create pricing pressures on all home sellers for several more years. In the real estate graph below, we see the one-year trend of lis pendens filings (green bars) and the one-year trend of foreclosure sales in Tallahassee (red bars), while the resulting blue line shows the one-year trend of foreclosure conversions (lis pendens filings that resulted in an actual foreclosure sale). The red bars show a very clear trend of decline for the Tallahassee foreclosure rate for the past 10 months, and the green bars show new filings have been dropping for nearly two years, though the rate of decline is flattening. If you visit our Tallahassee Foreclosures Website, you will find reports of the new lis pendens filings going back to 2008. These are the "real deal," not just estimates by a large information gatherer. 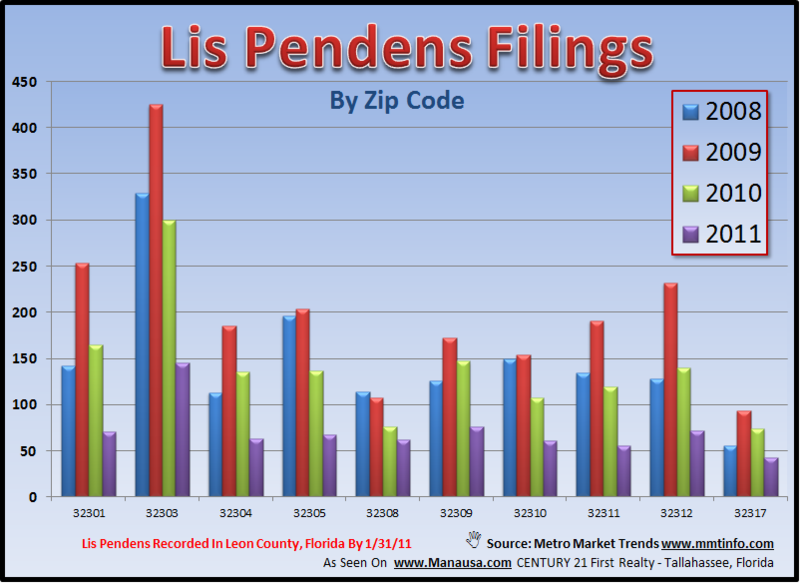 These are homes that have had lis pendens filed and are in the process as shown in the graph above. Historically (meaning prior to 2008), less than 15% of lis pendens filed resulted in a foreclosure sale, as the property owner would either make the loan current, surrender the deed, or sell the property before a foreclosure sale was actually needed. 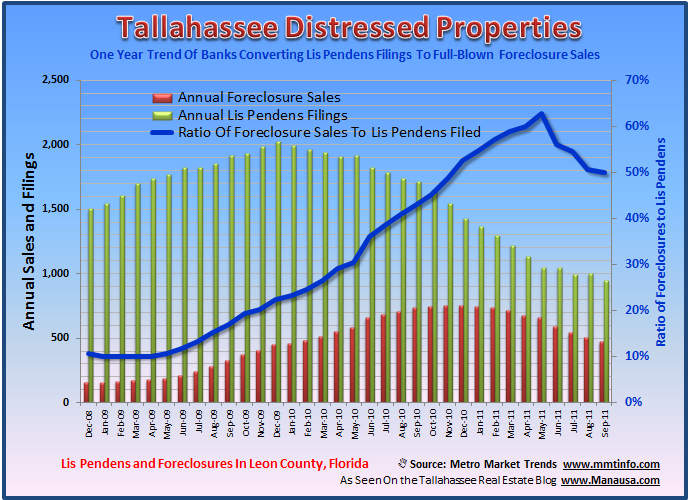 But with the mass of distressed properties in Tallahassee (and around the US for that matter), we are currently seeing 50% of the lis pendens resulting in a foreclosure sale. I was curious to see where the lis pendens filings were occurring in the Tallahassee real estate market, so I produced the following graph, organized by zip code. New filings have been spread out fairly equally across all zip codes, with the exception of 32303 which looms as the hardest hit area. So, if you are wanting to know the real story on the Tallahassee foreclosure rate, just check in to our regular lis pendens and foreclosure reports that occur several times each month. The information is far more current that you will find anywhere else on the internet, and we use the actual figures from the Tallahassee real estate market to produce our results. The large national aggregators cannot monitor every market to the fine level of detail that we do, simply because they do not see Tallahassee as a large enough market to matter. To me, it matters.